Canada's telecommunications regulator has approved BCE Inc.'s $3.4-billion takeover of Montreal-based media giant Astral Media Inc., but with several conditions that the Canadian Radio-television and Telecommunications Commission says will protect the public interest and safeguard a competitive broadcast environment. Canada's telecommunications regulator has approved BCE Inc.'s $3.4-billion takeover of Montreal-based media giant Astral Media Inc., but with several conditions that the Canadian Radio-television and Telecommunications Commission says will protect the public interest. "To ensure the public interest is served, we are requiring BCE to invest in new Canadian programming and sell more than a dozen services, and we are putting in place a number of competitive safeguards," CRTC chairman Jean-Pierre Blais said in a news release. "This will maintain a healthy and competitive broadcasting system that offers more programming choices to Canadian consumers and citizens and more opportunities for Canadian creators." Astral Media Inc. owns more than 80 radio stations across the country, numerous French- and English-language specialty television channels, including the Movie Network — which includes HBO Canada — and Super Écran, and a number of billboard advertising assets. The CRTC approved the sale of Astral to BCE on condition that BCE, whose media division is known as Bell Media, sells off 10 of the radio stations it acquired in the deal as well as 11 specialty TV channels, including Teletoon, the Family Channel, the Cartoon Network, Disney XD and MusiquePlus. Bell already has a tentative $400.6-million offer from Corus Entertainment to buy several of the specialty channels, including Teletoon, Cartoon Network and Historia, and two radio stations. Even with those divestitures, the deal gives BCE unprecedented access to specialty and pay TV programming, including movies and sports, and to the French-language broadcast market, where it has not had a significant presence to date. The new deal gives BCE control of 22.6 per cent of the French-language television market and 35.8 per cent of the English-language market, about two per cent more than it has now. The merger will give BCE a big leg up over its competitors, including Quebecor, its biggest rival in Quebec, said John Lawford, executive director and general counsel for the Vancouver-based Public Interest Advocacy Centre, which lobbies on behalf of consumer rights. Even though Quebecor controls about 31 per cent of the French-language market, it doesn't have many specialty channels like those BCE has just acquired, Lawford said. "In French pay and specialty [television], Quebecor doesn't have very much; now, Bell has a lot," Lawford said. "Basically, if you want to get TV packages in Quebec or otherwise, you're dealing with Bell Media and … Bell Media feeds into Bell TV. So, the deals that get passed toward Rogers or Telus or anybody else who tries to do TV aren't going to be that exciting." The CRTC tried to curb BCE's reach into specialty programming by requiring the media conglomerate to allow other providers access to the new channels at a reasonable price. The deal prohibits BCE from imposing "restrictive bundling requirements" on providers seeking to carry the Movie Network, for example, or Super Écran. BCE will also have to invest $246.9 million into creating original Canadian TV and radio programming, $72 million more than it had proposed. Of that, $175.4 million will have to be spent in the television sector and the rest on radio. As part of the radio investment, the merged company will have to provide funding to non-profit organizations that support the development of the Canadian music industry. The CRTC also imposed a condition that will require BCE to keep open all of its existing local television stations plus the two it acquired from Astral until at least 2017. It must maintain its current level of local news and other programming in the 29 markets served by those stations for that time, the regulator said. It also imposed a condition on the acquisition of Montreal's CKGM radio station. "Given the strong support expressed by Montreal’s English-language minority community for this station, BCE will have to maintain its current sports format for at least seven years," the CRTC said. BCE acquired four Montreal English-language radio stations in the merger, including the popular CJAD. One of the conditions the CRTC imposed on BCE's new radio acquisitions is that it provide "reasonable access" to radio advertising opportunities to all competitors. 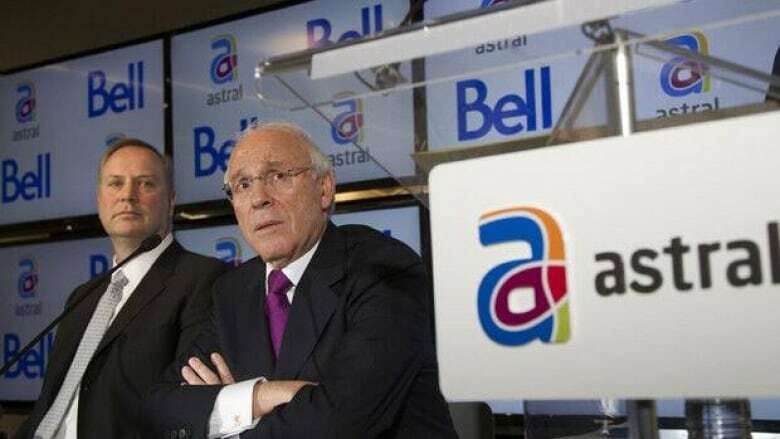 The $3.38-billion deal approved Thursday was BCE's second attempt to buy Astral's assets. Read the full list of which Astral TV channels and radio stations BCE acquired in the deal. The CRTC rejected the first merger proposal last fall, saying it would restrict consumer choice and raise prices. The original deal would have given BCE control of almost 45 per cent of Canada's English TV viewership, and almost 35 per cent of the French-language audience. Even with the obligatory divestitures and imposed conditions, the deal represents an unprecedented level of vertical integration and media concentration, Lawford said. And even though the CRTC has obliged BCE to follow its code of conduct on vertical integration and not abuse its dominant position to influence the negotiations of its smaller competitors, it's unlikely the regulator will be able to ensure the media behemoth follows through, he said. "They'll have to be extremely vigilant given the size that Bell’s at now to actually be able to police it," he said. "Last time around, they said it would be too much of a regulatory burden to do that, and now, they've set themselves up to take on the regulatory burden." Ensuring BCE adheres to the regulator's conditions and doesn't engage in anti-competitive practices will take not just vigilance but a willingness to spend a lot of time and energy arguing the issue before the CRTC. "The independent broadcasters that are left are so small now, they can't exert any influence whatsoever, even with the commission standing in their corner and handing them the gloves and wiping them off in every round. It's not going to be good enough," Lawford said. Bell Media's rivals have criticized the proposed merger from the start, fearing it would give BCE too much control of the broadcast market. In its submission before the CRTC, Quebecor told the regulator that "a monster would be created" if the merger went ahead. "A company with such control should not exist," Quebecor CEO Robert Dépatie said at a CRTC hearing in May. BCE shares were trading at $41.96 by the end of trading on the Toronto Stock Exchange on Thursday, a slight increase of 0.94 per cent over the previous day. Trading ended before the CRTC decision was announced. Astral Media shares closed at $48.24, up 0.27 per cent.